We all lead busy lives and when we get in the car, things don’t just automatically turn off. Our busy lives keep on rolling as we move down the road so it’s common for many people to continue to multitask behind the wheel. The problem with this is that when you’re driving, you are operating a large vehicle that has the capacity to seriously injure or kill you, your passengers, and other people on the road. Your desk does not. So when you get in the car, it’s best to keep distraction to a minimal level. Taking your eyes off the road for just a moment could spell disaster and it’s those few quick seconds you may end up regretting forever. So, don’t multitask in the car. If you avoid accidents, no matter how big or small, you will also avoid making insurance claims. The less claims you have riding on your policy, the lower your premiums. This means more money in your wallet. So while it may simple at first, small distractions can have a ripple effect that last long after you’ve hung your phone up. Distracted driving can cause your insurance rates to go up, just as this site suggests. It’s hard to imagine the days before cell phones when you had to actually be home to talk to somebody. But now that’s a thing of the past and we are not only in touch with each other but the rest of the world on a 24-7 basis and this can all be done through your phone. So, it’s easy to understand why so many people are glued to the tiny screen but it also requires a certain amount of attention. When you’re driving, the focus needs to be on the road and not your cell phone. Many states have created laws that specifically forbid talking and texting on cell phones. That conversation you were having with your best friend may seem important enough to continue in the car but it’s not. Don’t use a cell phone while driving. As a parent, you have the responsibility of caring for your child and this means making sure they are safe under all circumstances. But we all know how rambunctious children can be and when they are strapped into a car, sometimes it only gets worse. Add a few other kids to the mix and you’ve got a loud daycare in your car. Talk about distracting! 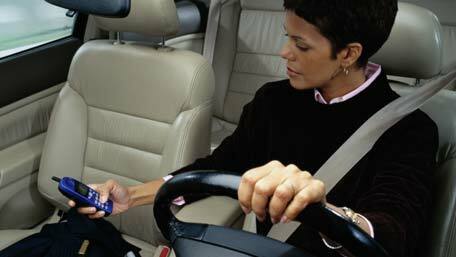 Your first instinct may be to try to discipline the children as you drive but this requires a huge amount of attention from a driver. If your children are misbehaving or playing too loudly while in the car, try to pull over to the side of the road to address their behavior. It may take some time out of your day but you will be ensuring their safety as well as yours. For someone with a busy schedule, the to-go order is a heaven-send. You can drive to your destination and eat your meal at the same time, killing two birds with one stone. The only problem is that your delicious cheeseburger is taking your attention, both mentally and physically, off the road. To eat your burger or take a sip of your drink, you have to remove at least one hand from the steering wheel. One study even claims that eating on the go is just as dangerous as using a cell phone and can lead to a “greatly reduced ability to deal with other events.” If you’re eating on the go, you’re eating faster than normal and run the risk of choking. This will obviously deter your driving ability so if you’re pressed for time but starving, try not to combine the two activities for safety measure. Whether you’re still using the standard FM radio, have satellite radio or use your iPod or other device, a radio is distracting. We all enjoy listening to our favorite music while riding down the road. If you get into the car and can leave it on one station for the duration of your trip, that’s not very distracting. But if you are the kind of person who changes the channel rapidly or tries to switch CD’s en route, your hands and eyes are not focused on the road. Csaba Csere, editor of Car and Driver magazine puts it simply, “Don’t tune the radio when you’re negotiating traffic in a complicated intersection.” In fact, try not to do it at all. Although you might feel as if having a passenger can keep you focused on the road by keeping you awake, studies have actually proven that a passenger can be more distracting. The National Highway Traffic Safety Administration claims that in 2010, conversations with passengers in a car was “the leading distraction in 7,000 crashes.” It’s easy for a conversation to become extremely enveloping and cognitively, the driver is not focusing on the road. This means that in an unexpected event, your reaction time will be much slower than if your full attention was focused in the right direction. It may seem odd to drive in silence but at least try to avoid encompassing conversations. Luckily, with a passenger, you now have someone to tune the radio. If you’ve been driving for years, it can feel as natural as walking so it’s easy to forget the responsibility you hold. This is why many people have no qualms about driving while eating or trying to tune the radio but it’s those little things that can cause your entire life to change. It’s always important to remember that driving is a privilege and not a right so you need to treat it with the care and concern it deserves. Check with your insurance company to see if they offer any rewards for safe drivers. It may be the push you need to avoid those pesky distractions.